When we first received this recipe, we thought: Readers of The Nibble won’t want to buy or make the oleo saccharum. Holiday season is busy enough as it is. But we loved the recipe, and decided to make it for our own holiday celebration. We tasted the test batch and thought: We’ll be shortchanging our readers if we don’t share this. The recipe was created by Masahiro Urushido, an award-winning New York City bartender. He used Auchentoshan American Oak Single Malt Scotch, Rothman & Winter Orchard Apricot Liqueur and Lejay Creme de Cassis. This punch is inspired by traditional Scottish Christmas pudding, made with dried fruits such as raisins and apricots. 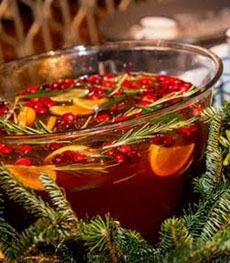 Masa calls his recipe Pepperdier Christmas Punch, adapting the name of a friend. But since that can be confusing to the rest of us (we tried to research “Pepperdier” online), we’ll rename it slightly to Scotch Christmas Punch, acknowledging both the country of inspiration and the Scotch whisky in the recipe. TOP PHOTO: Christmas punch. Photo by Gabi Porter. BOTTOM PHOTO: Oleo saccharum, a big-sounding name for citrus sugar syrup. Photo courtesy Cocktail & Sons. *We happened to have a good bottle of Lambrusco—a red sparkling wine—on hand and it went great with this recipe. Most people will use Cava, Prosecco or another sparkling white wine. 1. SOAK the raisins in the Scotch for several hours or overnight. 2. MAKE the oleo saccharum if you aren’t purchasing it (recipe). 3. MIX all ingredients except the sparkling wine in a punch bowl. Garnish with rosemary, cranberries, orange slices and bay leaves. Top with sparkling wine and serve. If you don’t have a punch bowl, mix all ingredients except the sparkling wine in a pitcher. To serve, pour the punch into individual glasses, top with sparkling wine and garnish with an orange slice. photo is Scottish Morn from Harney & Sons. blend from Jenier Teas. WHAT IS OLEO SACCHARUM? Oleo saccharum is citrus oil blended with sugar. In Latin, oleo means oil and saccharum means sugar. It became prominent in the 19th-century as a way to provide a subtle citrus flavor and aroma to sweetened drinks, instead of plain sugar syrup (simple syrup). Oleo saccharum is made from orange and/or lemon peels (lime peels have too much bitterness) that are muddled (crushed) to release the oils. Sugar is added to the muddled peel and mixes with the citrus oil that emerges from the skins. The peel is strained out, leaving sugared citrus oil. You can use it to add an elegant citrus note to any cocktail that requires sugar/simple syrup, and can blend it with club soda for a refreshing non-alcoholic drink. 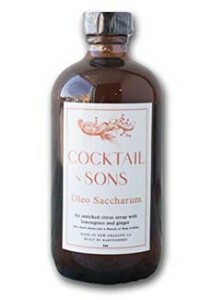 The bottled oleo saccharum from Cocktail & Sons, featured in the photo above, is a citrus syrup enriched with fresh lemongrass, toasted green cardamom and ginger. You can buy it on Amazon.com. Or, it’s easy enough to make your own. Here’s a recipe. WHAT IS SCOTTISH BREAKFAST TEA? Here’s something that few people outside the tea industry realize: Breakfast teas, notably English Breakfast, Irish Breakfast and Scottish Breakfast, are simply strong black tea blends. The blends have more flavor to stand up to milk or cream, complement British breakfast foods (eggs, porridge, ham, bacon, etc.) and provide heartiness (more body and caffeine) to energize the drinker in the morning. Afternoon tea blends tend to be lighter and smoother, to pair with sweets and tea sandwiches. The British first imported tea from China in the 17th century, to great public appreciation. Coffee was available at the time, but otherwise beer and stout were drunk by everyone, including children, because of contaminated water sources. The British became avid tea drinkers, and since the 18th century have been among the world’s greatest per capita tea consumers. English Breakfast Tea is the mildest of the strong teas. It can be a blend of teas from Africa, India (Assam), Indonesia and Sri Lanka (Ceylon), with a base of Chinese congou tea. 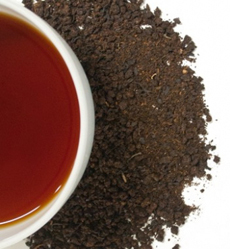 Originally, before tea cultivation expanded beyond China, it was unblended congou tea. 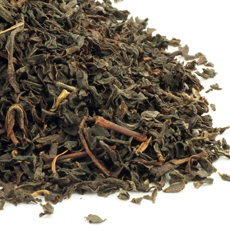 Irish Breakfast Tea has a good amount of Assam, giving it Assam’s malty flavor notes and reddish color. It often contain others black teas, including Darjeeling, to balance the intense flavors of Assam. Scottish Breakfast Tea is the strongest of the three, with a base of Assam plus the smoother Keemun tea from China, among other teas in the blend. It’s important to note that there is no standard formula for any of these blends and no governing body specifying what each should contain. The blends evolved over time, likely as one vendor sought to copy a popular blend offered by another vendor. And now you know about Scottish Breakfast Tea and its kin, English Breakfast and Irish Breakfast. Enjoy the teas…and the punch!